Since the passing of the new tax law, major tax software vendors such as TurboTax, H&R Block, and TaxACT updated their online tax calculators to include a comparison between 2017 and 2018. These tax calculators do an adequate job for the most part. However, none of them includes the premium tax credit when you get health insurance under the Affordable Care Act (ACA), also known as Obamacare. To millions of people who get subsidy for health insurance from the ACA, this is a major gap, because their income affects the amount of subsidy they will receive. Getting more subsidy reduces their tax dollar for dollar; qualifying for less subsidy increases their tax dollar for dollar. The most accurate way to project taxes is to use the downloaded/installed tax software. However, 2018 tax software won’t be available until November or December. I found a link to a spreadsheet posted to the Bogleheads Wiki. It’s called Personal Finance Toolbox. It’s an actual spreadsheet file, not an online one. You will need Microsoft Excel or compatible software to open it. As with anything downloaded from the Internet, you will have to trust the source. With 13 tabs, this spreadsheet does a lot of things. It looks overwhelming if you are only looking for one feature out of many. 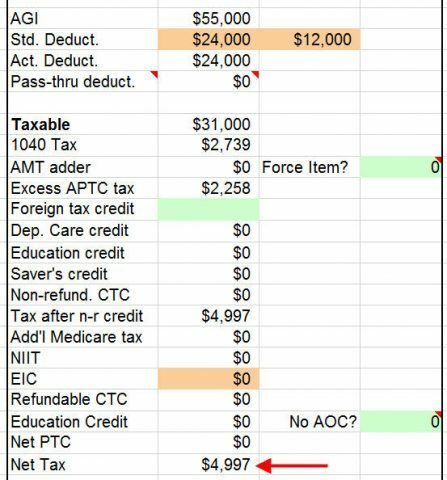 I will show you how this spreadsheet can help calculate the effect of Roth conversion or long-term capital gains when you receive subsidy for health insurance from ACA. I used version 11.13 released on July 20, 2018. I don’t know the author of this spreadsheet. Nor did I verify its accuracy. I assume it’s reasonably accurate because it looks like the author put a lot of work into it. How does it affect their taxes if they convert additional $10,000 from their traditional IRA to Roth? How does it affect their taxes if they realize $10,000 in long-term capital gains? We go to the Calculations tab. First we enter their filing status, number of dependents, and ages starting at cell G2. Next we enter their income. Because they are retired, we skip the paycheck items and we go down to non-paycheck income starting at cell D23. We only input into cells in green. Use annual numbers here. Then we go down to the monthly average expense section and enter the full price health insurance premium and the advance subsidy in cells B113 and B114. Remember to enter the monthly numbers here. Enter the advance subsidy amount as a negative number. Now scroll to the far right to cell AC87 or use the find function in your spreadsheet software to locate “Form 8962.” Enter the full price of the second lowest cost Silver plan in cell AE99. Use the annual number here. You may notice it shows “Other 48” in this area. If you live in Alaska or Hawaii, enter “AK” or “HI” in cell H35. Finally, we go back to the tax calculation area starting at cell F11. This shows their baseline estimated federal income tax. As you see from above, the spreadsheet estimates that this retired couple will pay $2,552 in federal income tax for 2018. With $45,000 in AGI, that’s average tax rate under 6%. Normally they would be good candidates for converting a part of their traditional IRA to Roth to take advantage of their low tax rate before they start Social Security and before RMDs start. What happens if they convert $10,000 from traditional IRA to Roth? We go to the non-paycheck income section and change cell D31 for “tIRA distribution” from $40,000 to $50,000. Now we go back to the tax calculation area starting at cell F11. The estimated total federal income tax changes from $2,552 in the baseline to $4,997. $4,997 – $2,552 = $2,445. This means they will pay additional $2,445 in federal income tax when they convert $10,000 to Roth. That’s 24.5% marginal tax rate (higher if the state also taxes the conversion). 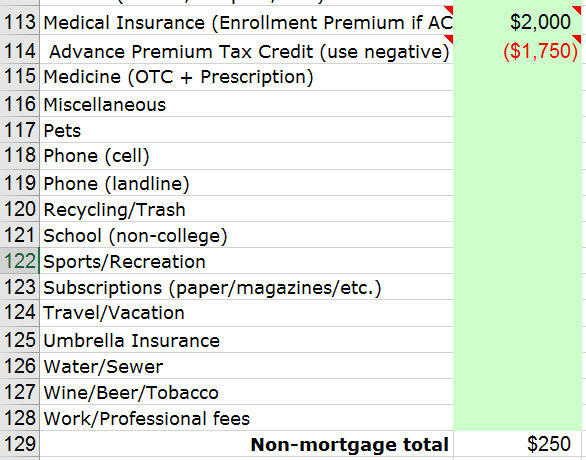 Due to the loss in health insurance subsidy, the Roth conversion is effectively taxed twice as high as otherwise. Now we go back to the tax calculation area starting at cell F11. The estimated total federal income tax changes from $2,552 in the baseline to $3,858. $3,858 – $2,552 = $1,306. This means they will pay additional $1,306 in federal income tax, or a 13% marginal tax rate when they realize $10,000 long-term capital gains. Long-term capital gains are normally taxed at 0% at their income level. The tax increase in this scenario comes 100% from qualifying for a lower ACA health insurance subsidy. The marginal tax rate is higher still if you add state income tax on the capital gains. This exercise shows that converting to Roth or realizing long-term capital gains while receiving health insurance subsidy from ACA/Obamacare will incur higher federal income tax than if you are not receiving the health insurance subsidy. The Personal Finance Toolbox spreadsheet does a good job in calculating the effect. It isn’t the easiest to use when you have to go all over the place to find the right spot for your inputs and look at the results. However, it works once you know where to enter things and what to look for. It includes the effect on ACA subsidy when tax calculators from major tax software vendors don’t. I thank its author for making this tool available. This looks interesting. I plan to download the spreadsheet and try it out. What I’ve done so far is to use our 2017 tax program, saving last year’s tax filing to a file named “Estimated 2018 Taxes,” manually over-ridden the personal exemptions with $0 and manually over-ridden the standard deduction with $24,000 (since our itemized deductions are less than that). Then, entering our known & projected 2018 income, we establish a baseline income/tax estimate and then tweak the numbers for various “what if” scenarios. Through tax-efficiently withdrawing from our assets, we keep our MAGI low enough to qualify for subsidized Marketplace insurance, we’ve had to (carefully) keep up with these “what if” scenarios the past five years. Looking forward to trying out that spreadsheet! Come next year it will be easier to use the tax software after they update the software for the new law. Thank you Harry for this article. I hope it will help many to be able to better project their tax implications early in their tax year so they don’t fall into the trap I did the first year the ACA went into effect. I had two operations and my wife had one that year so my medical expenses hit the Max out of Pocket for that year $10,500. So I wanted to pay all my medical bills and so withdrew money from my IRA to do so. I withdrew enough to pay those costs, my health insurance costs and a little more. One GRAVE mistake I made was assuming that since those moneys went towards medical expenses they were not taxable just as they did not incur the 10% early withdrawal tax from early distrubution from my IRA….WRONG! It was included in my MAGI and the extra I took out put me over the 400% of Federal Poverty Level Limitation for qualifying for the ACA credit and I had to pay back the $10,000 credit I had received. Had I known that taking that money out would have disqualified me for the credit and also known that by taking just a little less … OR… DEFERRED PAYING PART OF MY MEDICAL BILL until January of 2015 and thus shifting taking some of the money to a new tax year my extra tax bill would have gone up only $2500 instead of $10,000. Unfortunately there were no tax programs that were prepared for the new ACA available until late that year. I used Turbo Tax in April of 2015 for my 2014 taxes and their software even missed that the IRA distributions should not have incurred the extra 10% penalty because my medical expenses were high enough. My 2015 tax preparer caught that in the first couple of minutes looking at my 2014 return and filed an amended return and got that money back for me. That was only the second time in more than 40 years I didn’t do my own taxes. The other involved a real estate sale and monthly contract. 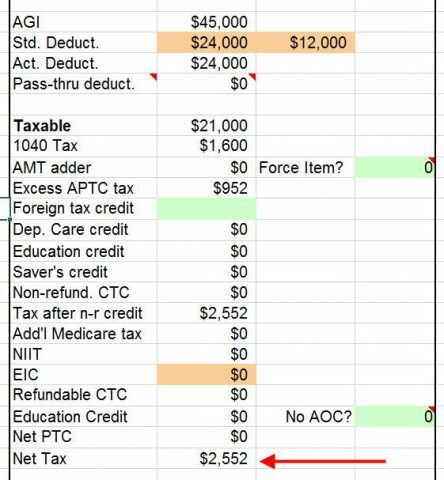 In your first two scenarios above if they had taken or converted $25,000 they would have exceed the 400% by just $40 and been subject to repaying the ACA credit and their tax bill would have gone up to $23,729… an almost 50% tax! One note the FPL changes every year and is published around November of the year before it changes and is based the year before the tax year it is published for. Harry does a good job of explaining that here: https://thefinancebuff.com/federal-poverty-levels-for-obamacare.html. That link did pop up as the number one listed in my sear for 2018 Federal Poverty Level. Some links don’t do as good a job explaining the FPL and can be a bit confusing for some. We have been cautious – probably over-cautious – so as not to exceed that 400% FPL threshold that you mention. We’ve purchased our health insurance through the Marketplace since its inception five years ago. We’ve been careful to tax-efficiently withdraw from our investments during this time – keeping a solid track on our MAGI the entire time. We were fortunate to have read a number of horror scenarios about this “cliff” as the ACA rolled out, and carefully set up our income and tax estimations every year to consider the various FPL thresholds. Best of luck in keeping on top of this in future years. Bottom line, the ACA credit is reduced as income increases. I just call the effect an income tax. Even though it is not meant to be one, that is the effect for most taxpayers. The tricky part is that a jump to a higher contribution rate tier is applied to the *entire* ACA AGI. Tiers are at 2x, 2.5x, and 3x of the household FPL. If you stay within the same contribution tier, any added income will incur at most 9.69% tax since that is the maximum contribution tier for eligible incomes. It’s a bit of irony really, that people have misunderstood for years income tax brackets as applying to the entire income yet the ACA tax credit (reduction) does just that. I meant to add .. The function returns a value that when divided by 10,000 gives the contribution percent to apply to ACA AGI. FPL = 12,060+4180 = $16,240. Levelized then would be 2.463*100 = 246. The contribution percentage is always applied to the entire ACA AGI; the point here is that each bracket has a slope of either 148/50 or 178/50. The brackets are regressive. I have been looking for a calculator to help decide Roth conversions, whether to do them, if i do them, a plan to make them. The best relatively simple one i found was on Schwab’s website. Any other you might suggest for Roth decisions without the ACA piece? The ACA piece is only one cell (Cell G31) that it pulls from the Form 8962 calculation (starting at Cell AC87). 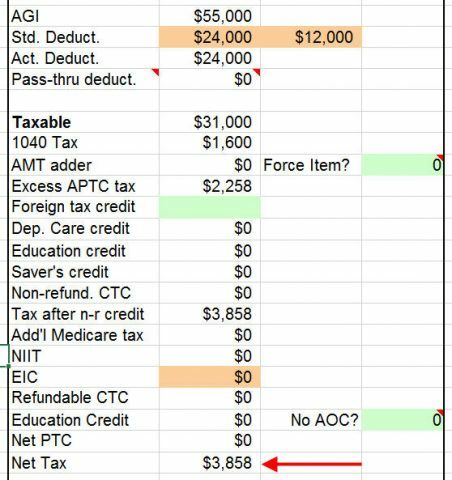 Simply disregard the single ACA piece (Net PTC) and what’s left is the regular tax portion impacted by the Roth conversion that you’re interested in. If you don’t need the ACA piece you have many choices. All 3 calculators linked at the top will be able to do it. You run it once without Roth conversion (or converting a smaller amount). You write down the bottom line number or print out the results. You run it again with Roth conversion (or converting a larger amount). You look at the bottom line number and see how much more you will pay. Harry, Please correct me if I am wrong. In the Calculations Tab of the spreadsheet, cell U48 shows you the marginal tax rate on ordinary income and cell U49 shows you the marginal tax rate on LTCG/QD. I checked it out and it seems to match a sample calculation I did that included ACA PTC effects. The marginal rate shown there includes effect of both, federal and state income tax. KD – You are right. It calculates the marginal tax rates by increasing the ordinary income and long-term capital gains by $100 respectively. I only showed federal income tax in this post. The numbers in U48 and U49 include both federal and state. The state income tax is estimated from the state entry in H35. All correct. I find the marginal rate graph more useful but those two cells work as described. Harry, great article! I’ll probably link to it in the ‘Instructions’ tab when uploading a new version. This spreadsheet started as a simple tool to help people organize their case study numbers for the mrmoneymustache forum, and has indeed grown over the years. Updates are published in https://forum.mrmoneymustache.com/forum-information-faqs/case-study-spreadsheet-updates/. That’s also a good place (or PMing via the MMM forum) for people to report bugs, suggest enhancements, etc. I also read the Bogleheads forum, and am happy to see it used there under the “personal finance toolbox” moniker. In Excel (other programs don’t seem to work as well), the chart near cell J106 can show the various marginal rates in picture form. Thank you for the hard work in putting this together. It sounds like “Personal Finance Toolbox” isn’t the official name. Should it be called the “Case Study Spreadsheet” instead? Case Study Spreadsheet is the original name, and fit the original purpose. Because its scope has increased over time, calling it Personal Finance Toolbox is not unreasonable. Whatever one calls it, if it proves useful to people then I’m happy. 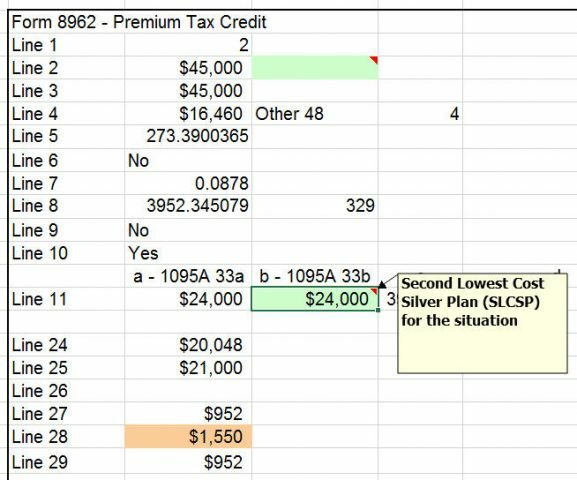 I used this spreadsheet extensively (though not the ACA part) a few months back to understand the marginal rates as they apply to the decision on whether it makes sense to do Roth conversions, or contributions vs putting the money in traditional, when child tax credits and the “Savers credit” comes into the picture. The answer is much the same — you need to be careful when you are in these very nonlinear areas of the tax codes because you can easily make the wrong decision. I just started playing around with this spreadsheet. A seemingly important data value is the SLCSP, which they don’t tell you until you receive your 1095 form in January. This is our first year in ACA, so the only thing I found was a tool on healthcare.gov to estimate the SLCSP for 2017 and a couple previous years. The amount calculated ($1,171) seems a little bit low to me as our 2018 bronze plan premium is over $1,400/month before APTC. If the SLCSP is wrong’, doesn’t that pretty much mess up this analysis? Much of what I’ve previously read suggests to do as much Roth conversions as possible (of course without going over the subsidy cliff!) during the years before turning 70. Is that strategy not as desirable now because of the tax analysis contained in this spreadsheet?? Also, if you’ve already done some Roth conversion, it appears they can’t be undone in 2018 and future. So you really have to be careful and thoughtful in strategizing! Thanks for this spreadsheet and all the great discussion! The healthcare exchange usually lets you shop before you apply. You can see the prices of all Silver plans offered in your area. Put in an income above 400% FPL when you shop. Then use second lowest price for your calculation. The equivalent additional tax from reducing your premium tax credit makes Roth conversion not as appealing than otherwise but that marginal tax rate may still be lower than the marginal tax rate you face after 70-1/2. You have to do the math and make some guesses. It’s not as clear cut as when you don’t need ACA premium tax credit. For us, the SLCSP estimator tool has almost always been wrong. (And the 1095 Form always matched the estimator tool.) But I always provided what I knew to be the correct SLCSP $ amount when I filed my tax return. Twice the IRS asked me for additional information regarding the SLCSP amount that I had filed. Twice they accepted my screen snapshot of that SLCSP for evidence. You do have an alternative. If you go to https://www.healthcare.gov/see-plans/#/ and then click on (where it indicates in fine print) “Looking for 2018 Plans and Prices?” – you can re-enter your 2018 family/income information and then take a look at the 2018 SLCSP. When I try this method, it’s off by only 8 cents from the amount in the screen snapshot I had taken during enrollment. Best of luck for you on this topic. Harry and Brian, thank you for that very valuable SLCSP methodology! As I mentioned above, the online tool gave me a result of $1,171. When I went back into 2018 plans for our ages/location, the SLCSP was actually $1,786, over $600 higher. That changes the game around for sure and I’ll play with the spreadsheet some more and also try out last years TTax program with overrides. The screenshot suggestion is excellent as well. The fact the IRS questioned your number vs. Form 1095 and accepted yours is very useful info. I use my local state marketplace but I imagine that other states and the federal are similar: I set my tax credit monthly use to zero and can then see the actual premium cost of the plans. 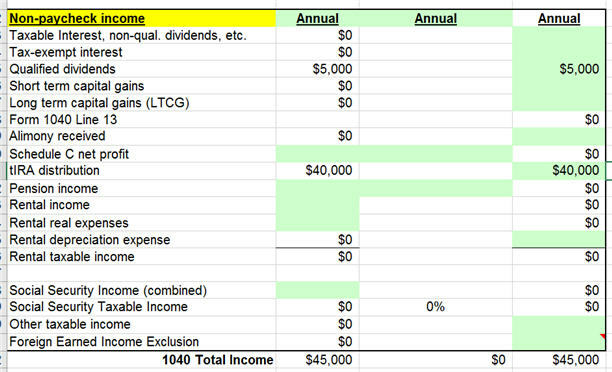 This lets me identify my SLCSP and choose a bronze plan that leaves enough tax credit for dental. By the way, note Harry’s choice of a plan with HSA eligibility. Interestingly, the 1095 I just received for 2018 nailed the SCLSP amount to the penny! That was a nice surprise and it will be a pleasure to not have the IRS ask about any discrepancies. The spreadsheet was most helpful in doing sensitivity analysis before end of year. I purchased TurboTax in December to help. I was comparing the results between the two and they tracked very nicely. Like Harry, we chose an HSA compatible plan which allowed for up to $7,900 contribution for 2018 (can be made up through April 15th, 2019). The HSA contributions are both tax deductible and reduce MAGI for ACA purposes. I have a question I hope someone can answer. When I looked at my 2017 tax return form 1095 lists SLCSP as $1,366.31 yet there was only one option for a silver plan for my county and that premium was $1,596.26. A difference of $229.85 per month or over $2500 per year! For 2018 and 2019 I still only have one silver plan available. If I have only one silver plan available why isn’t the SLCSP the same as my premium for my silver plan? That year they also made a mistake in my 1095 form and forgot I had a spouse and to include her part of the premium. My accountant didn’t even catch it and I had to apply for a new form 1095 before I could have my taxes done.